by Walter Van Tilburg Clark Author · Wallace Stegner Author of introduction, etc. 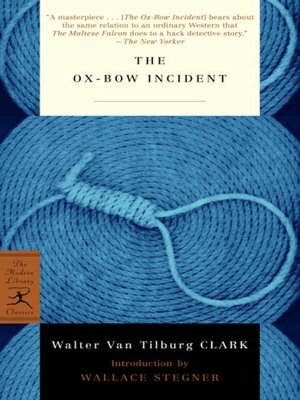 Set in 1885, The Ox-Bow Incident is a searing and realistic portrait of frontier life and mob violence in the American West. First published in 1940, it focuses on the lynching of three innocent men and the tragedy that ensues when law and order are abandoned. The result is an emotionally powerful, vivid, and unforgettable re-creation of the Western novel, which Clark transmuted into a universal story about good and evil, individual and community, justice and human nature. As Wallace Stegner writes, [Clark's] theme was civilization, and he recorded, indelibly, its first steps in a new country. Wallace Stegner's many books include Crossing to Safety, Where the Bluebird Sings to the Lemonade Springs, and the Pulitzer Prize winning Angle of Repose.